Healthcare facilities across the United States are implementing electronic records and devices to improve communications. Our Medical Check In system is a small but effective part of that movement. 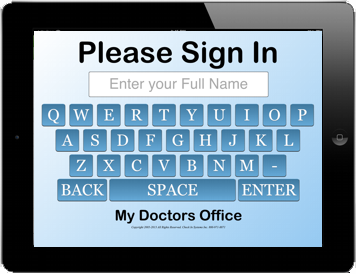 Every patient must start by signing in. 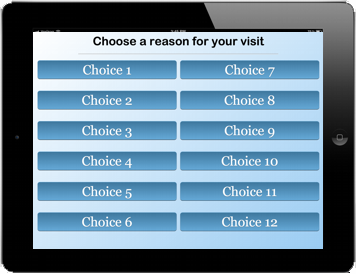 Check In Systems has made the sign in sheet fast and effective using a simple patient kiosk. Patient names are legible, arrival times are accurate and patients are organized. The information is now shareable and quickly accessed by anyone on your network. Automatic sorting allows departments to prepare for the patient and respond quicker therefore improving office workflow. Our signature product was designed in 2005 to improve HIPAA compliance. Since then the benefits of an improved sign in sheet have cleared the way to a more efficient office. As patients arrive they sign in without interrupting the staff. The staff then receives the name and needs of each patient on their computer, in the order they arrived. The system automatically time stamps and sorts the patients therefore allowing each department or provider to respond. A simple one click acknowledgement tells other staff that the patient is being served. Acknowledgement also time stamps the process. After the patient has been served they can be 'Checked Out' with one click, again time stamping the last step. From the time stamps, management can analyze the efficiency of each step. Valuable reports give insight to the medical office needs and efficiency. Touch screen devices have made patient kiosks easy. With the latest touch screen tablets comes a new generation of devices that are being put to the simple tasks of our offices. They are inexpensive, low maintenance and easy to replace. Apple iPads and Android tablets are less expensive to maintain compared to PC style touch screens. We use these latest devices to build an easy to use, patient kiosk. As offices become more computer oriented the practice management will need to ensure that the systems work together without conflict. When choosing practice management software, EMR software, patient billing and electronic sign in systems a key factor is the ability to work together and be flexible to work with future medical software additions. Medical Check In is compatible with ALL patient management software and EMR systems. Since 2005 our systems have been improving patient services. Paper sign-in sheets have to be near a receptionist, read by an individual and the information is only usable by that one person. To make it worse, the information is often unreadable and has to be stored for years. When you want to recall something from the paper it could take hours or even days to find what you need. Cheap...yes, efficient...no. Medical Check In solve all these issues. Our patient kiosk can be placed closer to the front door. This separates your desk and allows your private conversations to be uninterrupted by incoming patients. Having the sign in sheet away from the front desk also reduces interruptions. Interruptions cost time and money. We are not taking away the personal interaction but rather focusing it to the proper time. Once you call the patient, you are ready to have that personal time without being interrupted. With a patient kiosk your data is stored as long as you need it. With a name, reason and three simple date and time stamps, we can create reports to help analyze and manage your office efficiency. The data shows volumes by date and time, wait times for each person and reason, and allows you to evaluate office and staff performance.